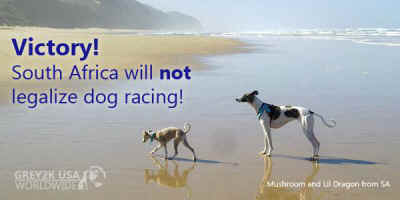 In June, we asked you to sign a petition to stop the expansion of commercial dog racing to South Africa. Today, we are pleased to announce that the Department of Trade and Industry listened to your concerns and has decided that dog racing will remain illegal in the country! Thanks are due to everyone around the world who wrote to officials and asked for the proposed authorization of dog racing to be dismissed. Our friends at the National Council of Societies for the Prevention of Cruelty to Animals and the International Fund for Animal Welfare also spoke out strongly to prevent the coming of this cruelty to South Africa. In fact, a television piece which featured these organizations and used our research is thought to have had great influence on the debate.